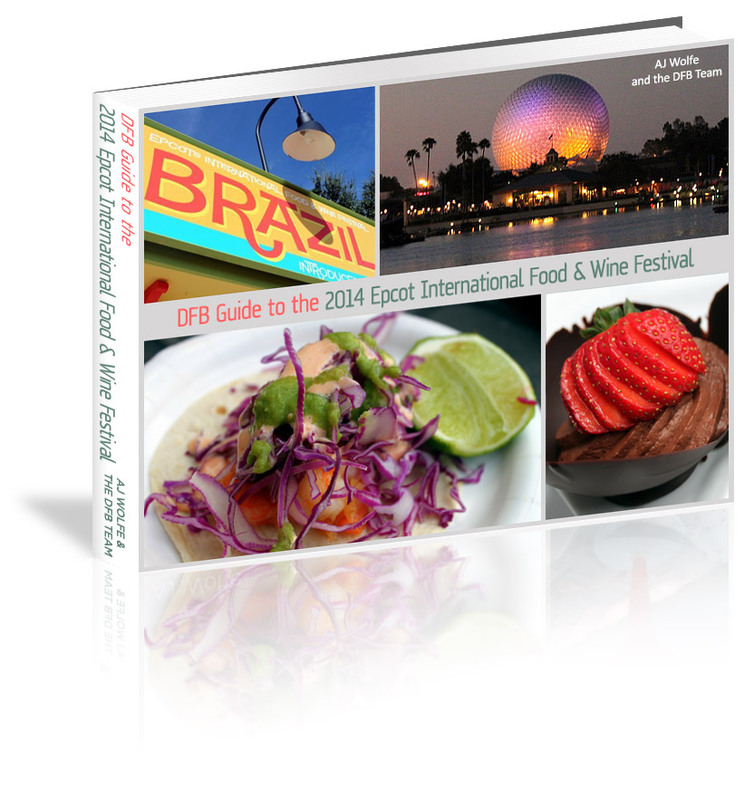 We’re back today with another delicious look at the 2014 Epcot Food and Wine Festival! 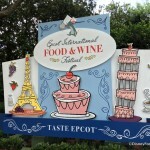 Welcome to the Epcot Food and Wine Festival! It’s always exciting to see what new Marketplaces and other experiences pop up each year at the Festival, but I’m always eager to indulge in my tried and true favorites as well! Today, let’s take a peek at some always-busy booths — France and Mexico — to take a closer look at both classics and brand new flavors. When you visit the France Marketplace, you’re participating in Food and Wine Festival Heritage! That’s right — it’s one of the original spots from the very first event, which was held in 1996. And though the menu has changed a bit from year to year, it’s always a favorite stop for guests. 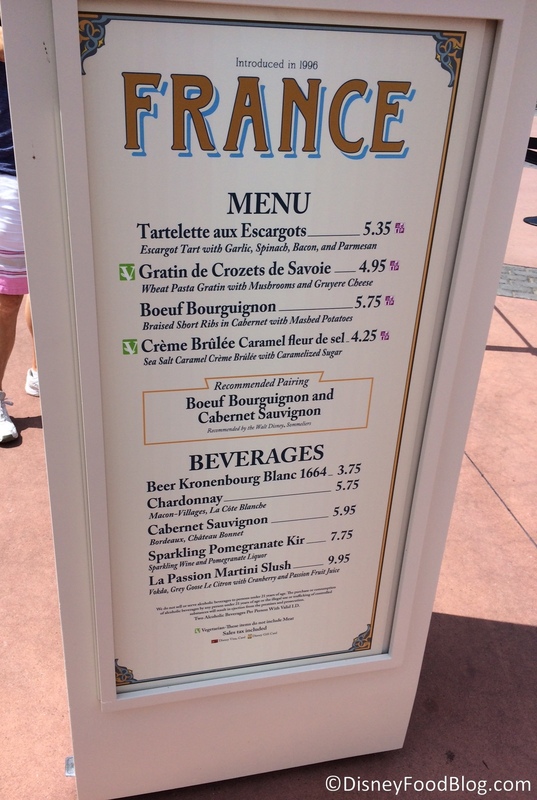 You’ll notice that the France booth has a very robust menu. With three different savory items, plus dessert, you could easily make a meal out of the offerings here. Add to that wines and cocktails, and you would definitely want to visit the Marketplace more than once to try everything. The big news at the France booth this year was a change to the classic Escargot offering. 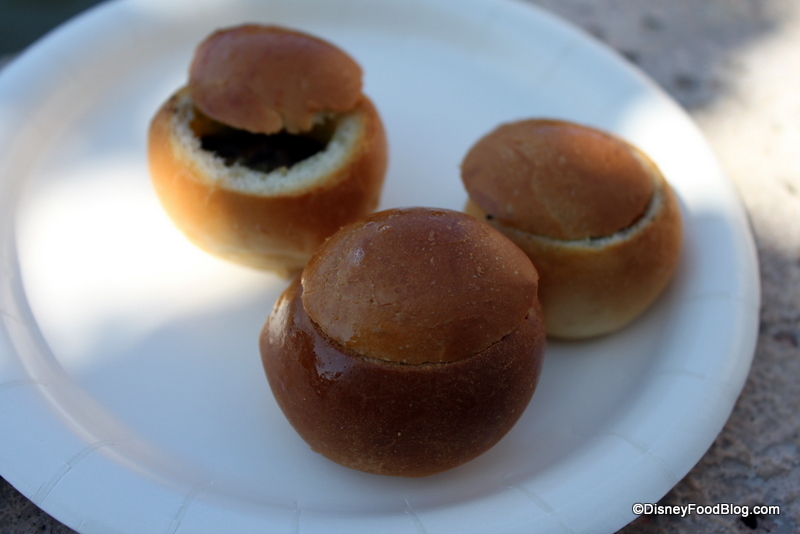 In the past, guests have enjoyed Escargots en Persillade in the perfect stroll-and-eat version; the escargots were nestled in rounds of Brioche. 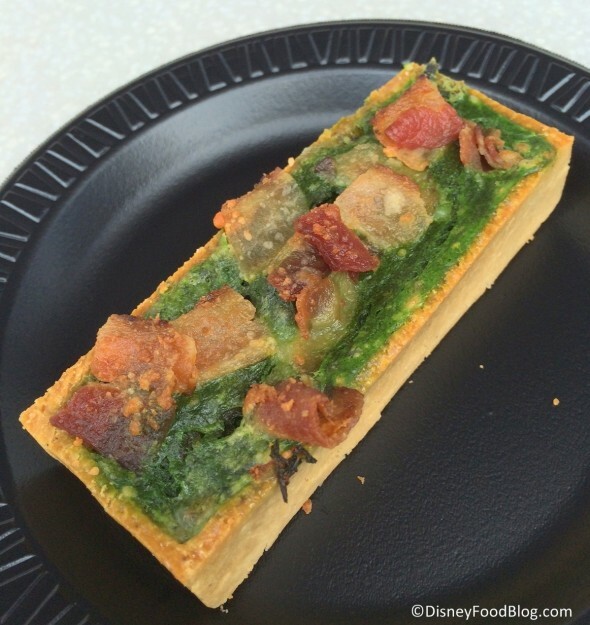 But in 2014, escargot became an ingredient in a savory tart. 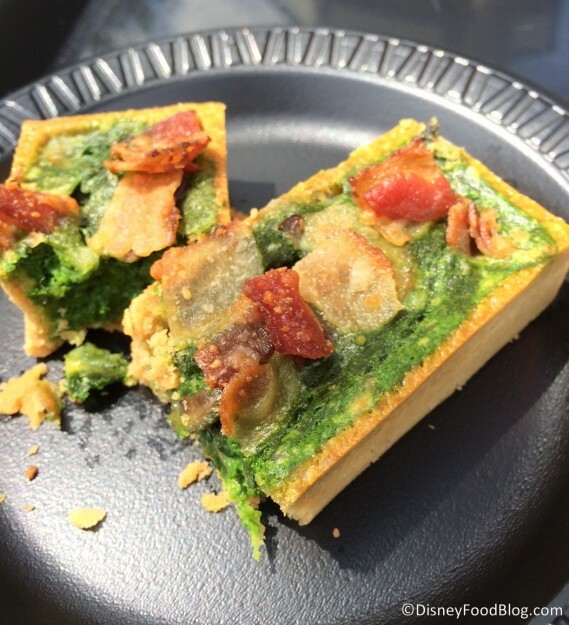 The Tartelette aux Escargots combined the Snails with Spinach, Garlic, Bacon, and Parmesan, presented in a deep, rectangular savory tart. This one has probably been one of the biggest controversies of the festival this year! We’ve heard from guests who love it, and from guests who hate it. Me? While I’m not a huge fan of spinach or snails on their own, the combo of flavors is an absolute win here. But really, is there a way to go wrong when Bacon and Garlic are involved?? 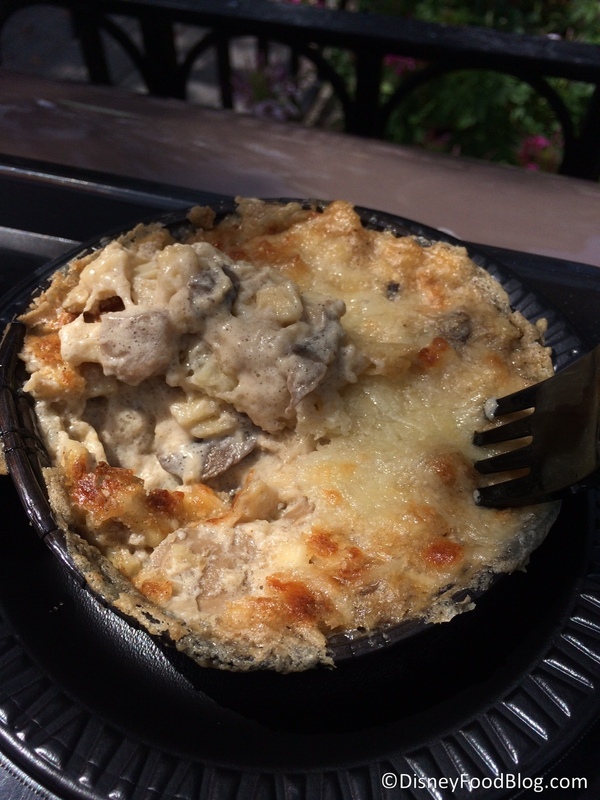 Also joining the line up this year is Gratin de Crozets de Savoie. The savory combination of Gruyere and Mushrooms makes this rich vegetarian dish a hit. The pasta used in the dish, Crozet, comes to us from Savoie. It’s a uniquely French version of pasta, customarily a whole wheat variety. Also on the menu is another popular option from years past: Boeuf Bourguignon is back for an encore in 2014. I absolutely love this dish. But I’m a meat, potatoes, and gravy kind of girl. France is also updating things a bit in the dessert department, as the Milk Chocolate Crème Brûlée of past years makes way for a hot flavor trend: Crème Brûlée Caramel Fleur de Sel. This is another winner in my book. I’m a big fan of salted caramel, and thought this version of the dish had more flavor and appeal than the milk chocolate from past years. 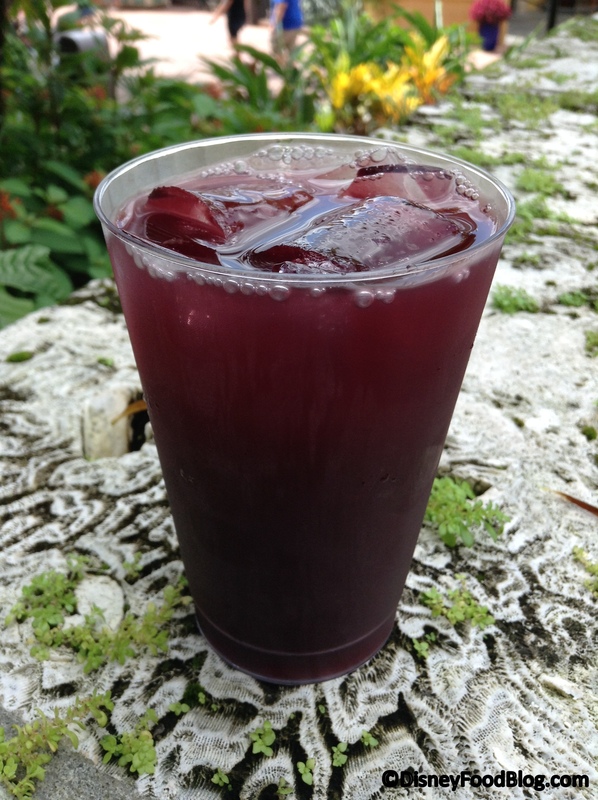 For those of us who are over 21, there’s also a fun new Grown Up Slush to enjoy here! The La Passion Martini Slush replaces the Cosmo Slush from the last few years. The passion fruit flavor definitely stands out, and this is a good addition to the Lemon and Orange varieties available in France year round. 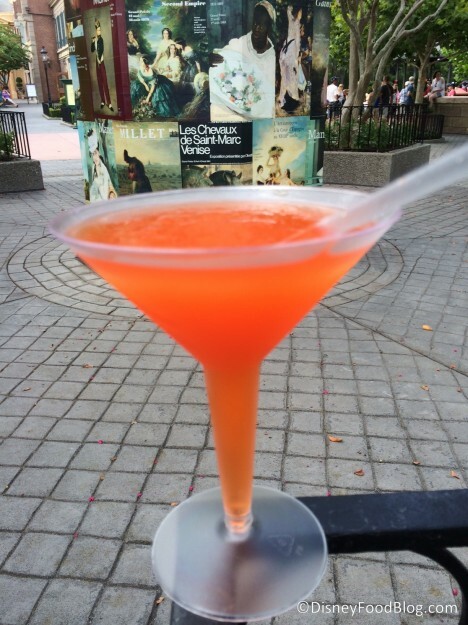 If you’ve never strolled the Promenade with a plastic martini glass in your hand, it’s time to change that. Walk clear around to the left entrance of World Showcase and you encounter our other featured booth, Mexico. This one has been around since the beginning of the Festival as well. The 2014 Mexico menu is fairly small when compared to the France menu. But it still offers some fan favorite tacos — one seafood and one meat. Dessert and a complementary array of beverages round out the offerings. Once again, they’re offering a Shrimp Taco here, but they’ve changed up the garnishes a bit. The crispy fried Shrimp are topped with Pickled Habanero Pepper and Onions this go around. The creamy Sauce and fresh Salsa temper the heat just a bit. This is one of our 2014 Best of the Fest Picks! The Rib-Eye Taco with Roasted Chipotle Sauce and Grilled Scallions is offered in a Corn Tortilla, which offers a contrast of flavors and textures — and also makes this a gluten-free option. This has always been one of our favorite dishes at the festival, so it’s nice to see it back in action. 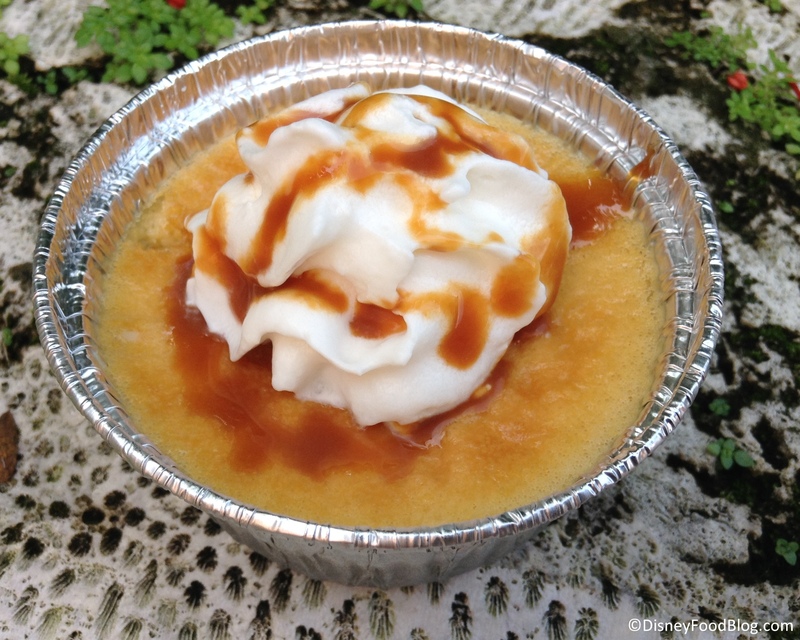 The Sweet Corn Cheesecake is…interesting. After experiencing the Sweet Corn Ice Cream at La Hacienda de San Angel, I wasn’t sure what to expect. This one is mildly sweet, pleasant, and rich. It’s not a must-have dish, but it certainly offers guests a unique dessert experience as they dine around the World. There are lots of different drinks to choose from here as well! I really enjoyed the Sangria this year with the Shrimp Taco. It was an excellent pairing! It’s also worth mentioning that the alcohol is a bit lighter in this one. So it’s a refreshing and less expensive option on your Drinking Around the World tour. 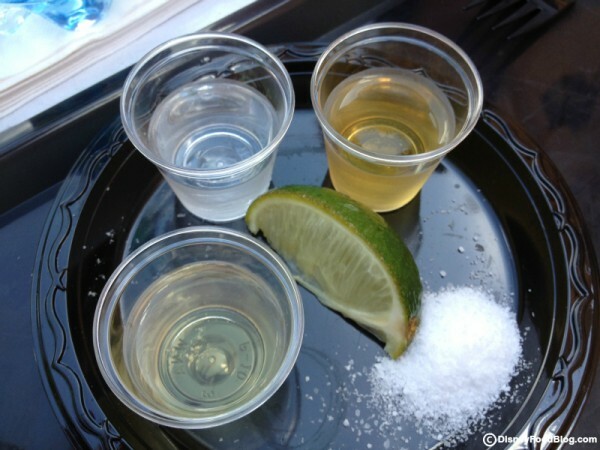 The popular Tequila Flight returns this year. It’s a great way to compare and determine which you prefer — Blanco, Reposado, or Anejo. Of course, this wouldn’t be Mexico without at least one Margarita, right? This year, the featured flavor is a fruit-flavored combo, Strawberry Mango. The more-sweet-than-tart drink is served on the rocks rather than frozen. And if none of these options appeals, there’s always the classic Dos Equis to enjoy! Whether you’re looking for Continental Cuisine with flair, or plenty of heat from South of the Border, you’ll find lots to enjoy at both France and Mexico. Definitely a couple of must-try booths. 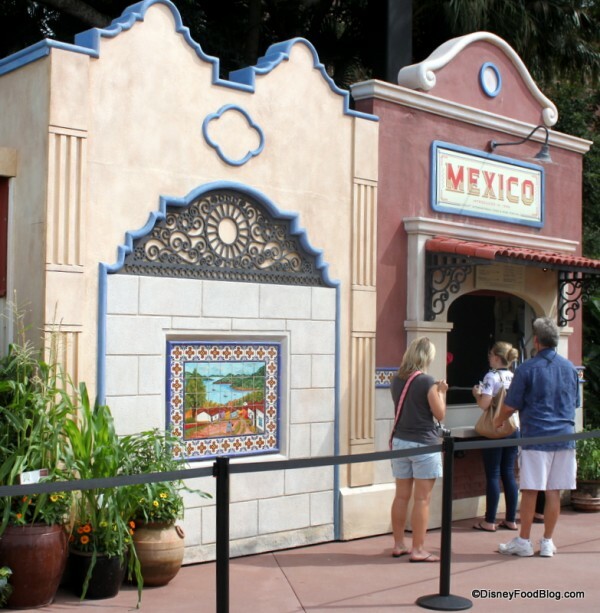 What dishes from the France or Mexico Booths are your new or classic favorites? Join in the conversation by leaving a comment! 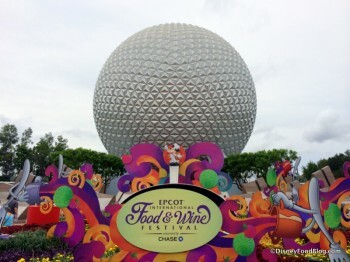 2018 Epcot International Food & Wine Festival Tips: How Many Days Should I Plan to Attend? 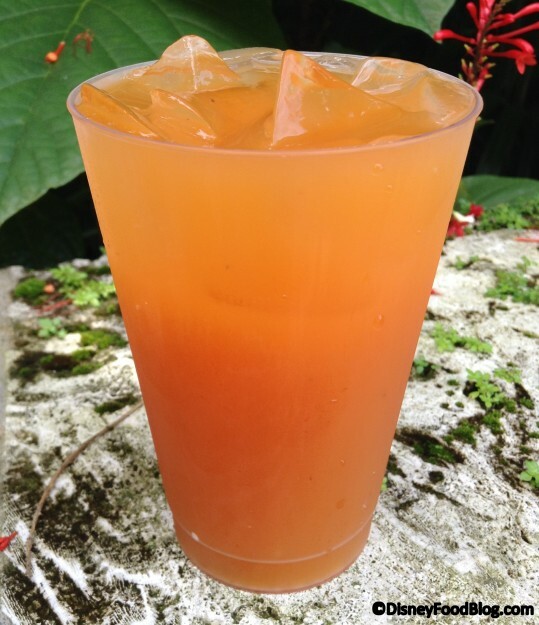 Kinda Disappointed Mexico isn’t offering the Habanero Mango Margarita this year. Have to agree with you on the corn cheesecake. I think um…interesting is a good way to put it. It wasn’t bad necessarily but I really didn’t care for it at all. Also, we had the ribeye taco. Ours looked nothing like yours. We had no scallion or lime and very little sauce. For us it was not a do over. The meat was bland and very fatty. We must have had an off day yesterday. My favorite from last year the potato leek waffle in Belgium still had the right flavors but it was a waffle with gravy. Not a piece of carrot or meat or anything. It was like the gravy you get at the bottom of your stew when all the pieces were eaten out. Several other items that were good last year were missing something yesterday. It was a bummer considering the costs! My husband has been absolutely fascinated with the idea of this sweet corn cheesecake ever since I mentioned it to him. I’ll have to try a bite of his when we go next month. I love sweet corn and I love cheesecake, and I wasn’t sure whether to get my own or not- these reviews have solidified that decision, lol. 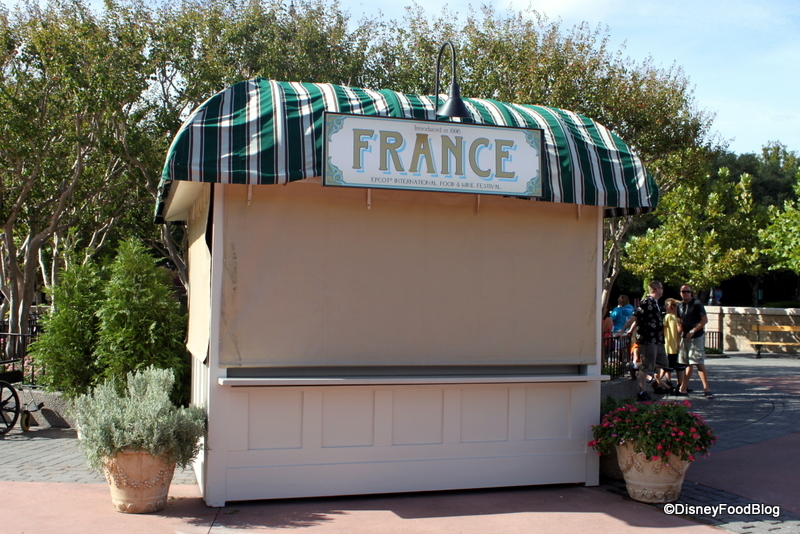 On the other hand, I will likely buy one of everything at the France booth. It all looks so good! 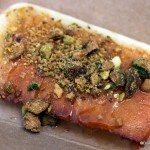 As I have already commented, the tart at the French booth is unbelievably rich and then intense. You won’t taste anything else for a while. Worth a try, but I don’t think I’d have another. That shrimp taco looks great, but a bit skimpy for the price. 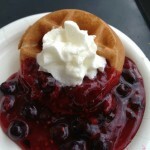 Had a great one off a food truck last weekend for only 4 bucks. It had 8 shrimp on it. Shrimp and Steak tacos are things that I can get anywhere but I’ve never seen a corn cheesecake before. Even though it didn’t get a great review I’m going to try it. 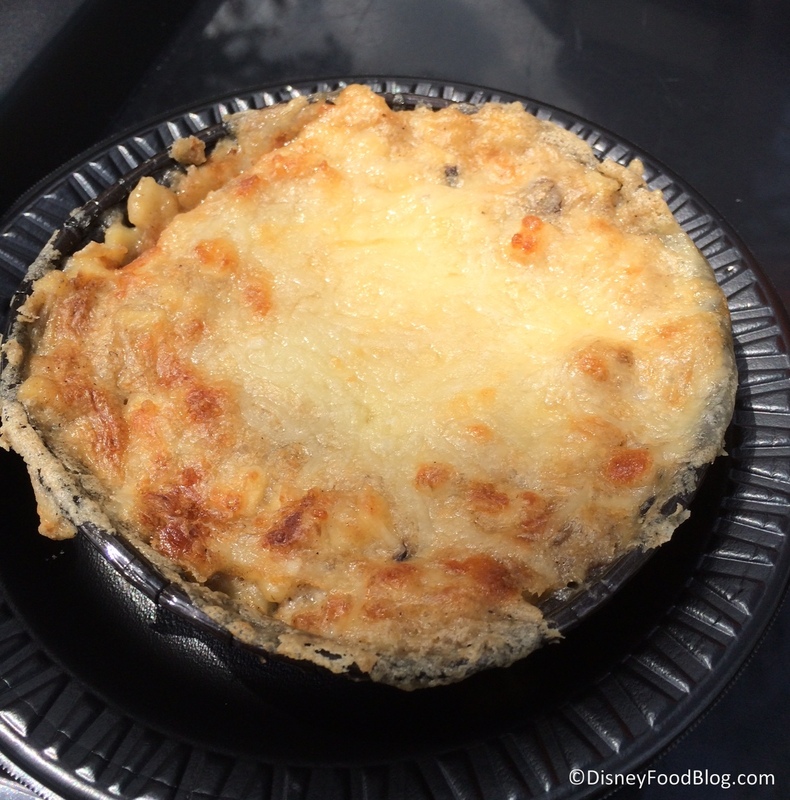 The only place I’ve ever had escargot is at Food and Wine, so that means I’ve only had it prepared the one way. I’m looking forward to the new flavors there. My friend and I LOVED the sweet corn cheesecake. We’re sad we did not try it until the last day of our trip. We would have eaten it all three days. We’re from the south (Georgia) and are fans of corn casserole and corn pudding, so this was right up our alley. 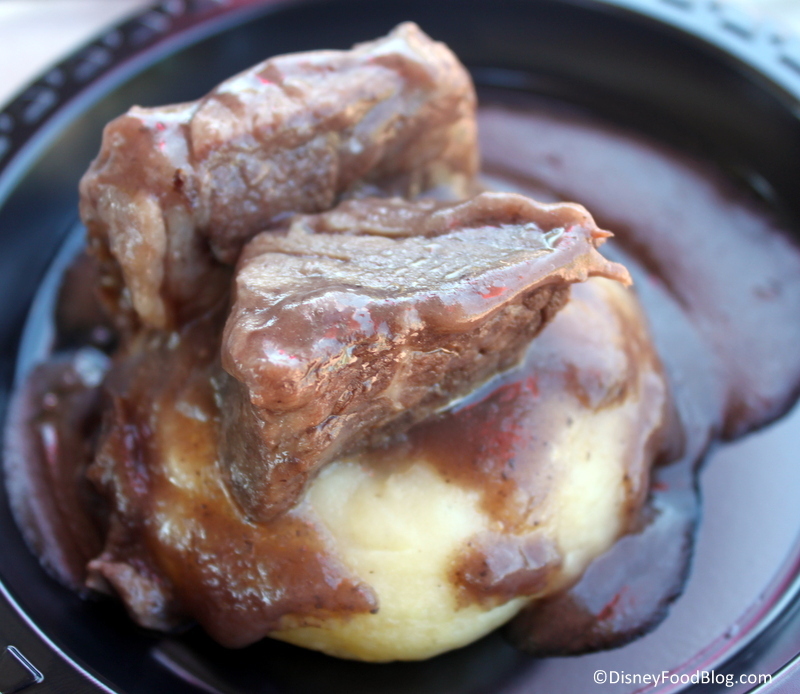 The Boeuf Bourguignon was the best non-alcoholic item we put in our mouths all weekend. 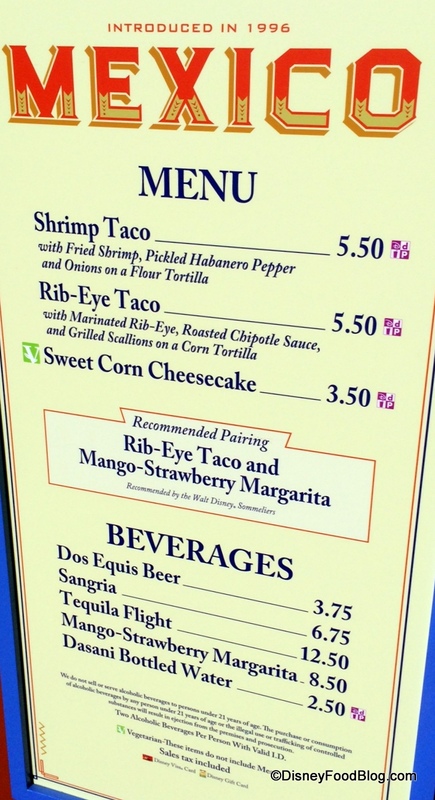 I was there last week and I have to say that the shrimp taco was hands down my favorite dish of the festival. I bought one and ended up going back a few hours later for two more. So good! A close second was the mac and cheese from France and the Scallop from Scotland. 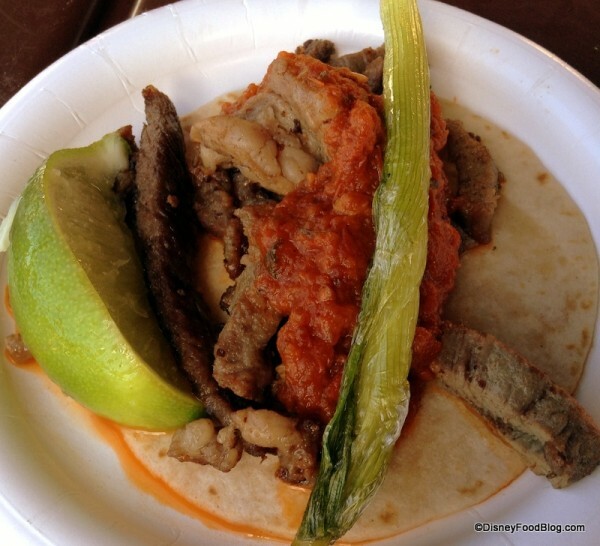 My least favorite – the Chicken Gyro from Greece. Even though they used dark meat chicken, I found it dry and flavorless. I’m with Marsha-LOVED the sweet corn cheesecake. I just wished they would have included the recipe in this years cookbook. Would love to make it. Loved the shrimp taco, sangria, and martini slush. My 25 year old daughter got the tequila flight, and it was very interesting. 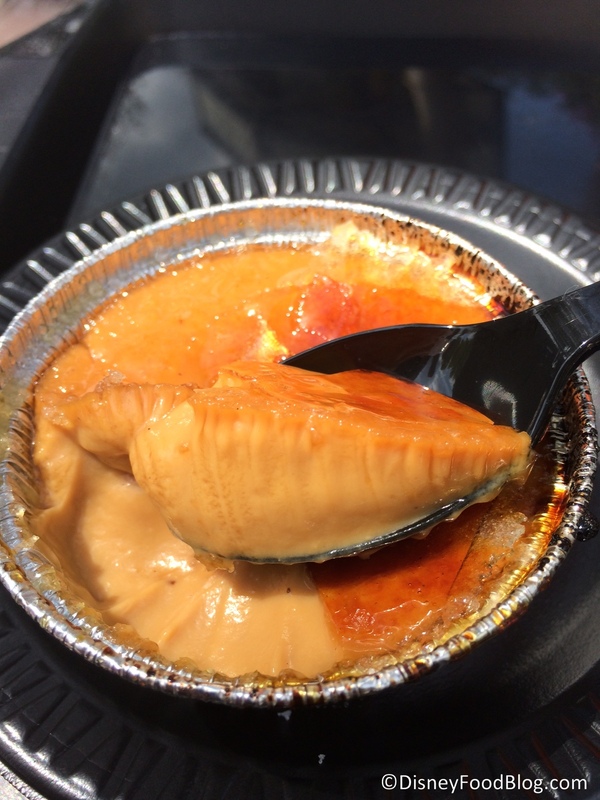 I plan to get the corn cheesecake, Kir, and escargot before the end of the festival. 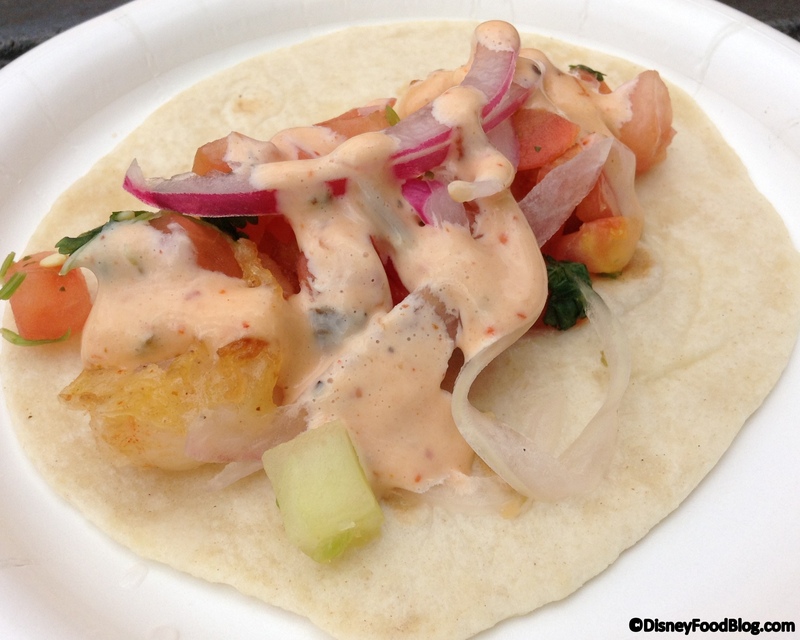 So far the shrimp taco is one of my favorite dishes at the festival. I loved the sweet corn cheesecake as well! Definitely worth trying as it is not something you see every day. I had it 3 times during my visit to Disney World last week! 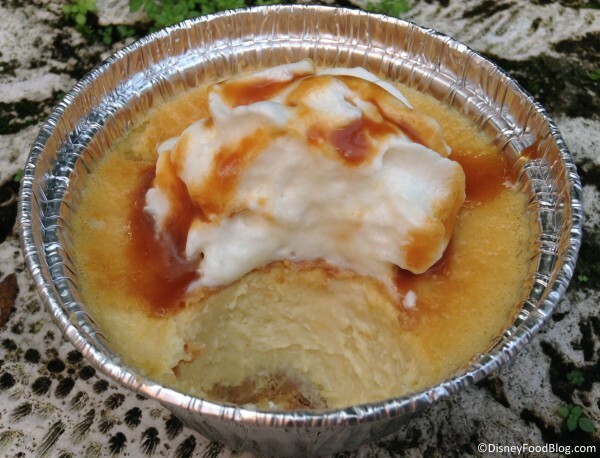 The only way to describe it is as a cross between cornbread/cheesecake, which probably turns most people off, but you will not be disappointed!! The rib eye taco was delicious! Probably my favorite dish this year now that I have had time to reflect. I also have to recommend the cheese dish offering at Hops and Barley, that was probably my second favorite. The pork belly from Brazil was my favorite last year, and for some reason, it fell short this year. Maybe I was served an off portion. It tasted fine, but it was chewy and cold. The beans were good though. My friend had the escargot tart and really enjoyed it. If I get to catch the festival again, I want to try the Gruyere and mushroom tart for sure! 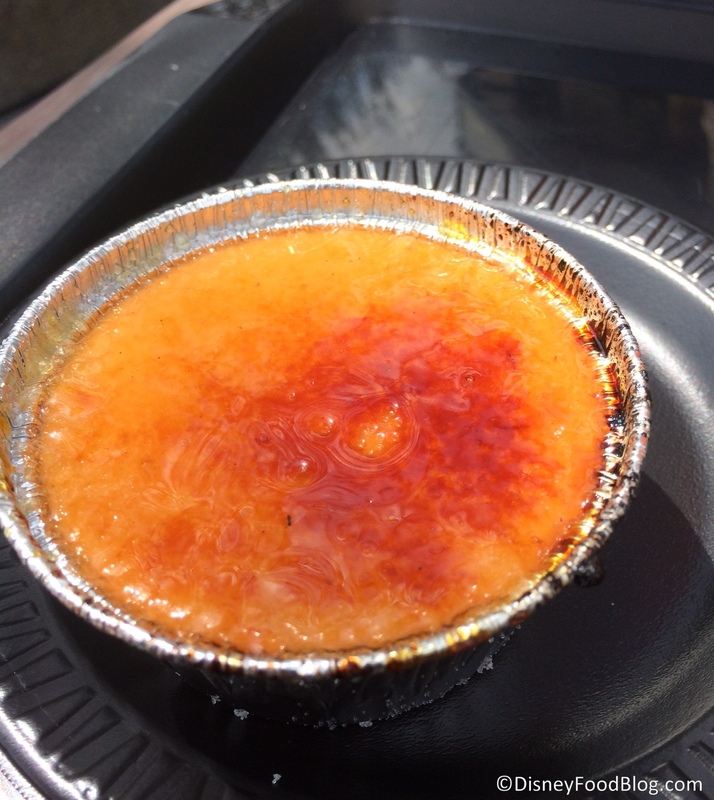 This has nothing to do with the festival offerings, but I have to comment on the creme brulee at Les Halles. It is always a MUST DO for me. But this past weekend, it was extra good. I don’t know , but I think the serving got larger too? Check it out! I absolutely loved the sweet corn cheesecake. Everyone in the group I was with today loved it and we want to add it to out Thanksgiving menu. Only problem is that they did not publish the recipe in the cookbook for this item. Any idea on the recipe? Any chance of getting the Sweet Corn Cheesecake recipe. Such a nice change of pace and delicious corn flavor as well. 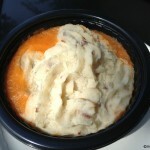 I loved the Sweet Corn Cheesecake! Easily my favorite out of everything I tried! 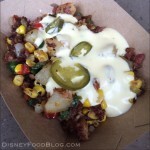 Which was a lot…Epcot Food and Wine Festival + Pregnant = No alcohol, but plenty of FOOD at almost every country! LOL I NEED THE RECIPE! 🙂 So delicious! I would love the recipe for the sweet corn cheesecake if anyone can find one!